Get an affordable renters insurance quote and apply online for coverage, all without an agent. No need to deal with an agent to compare rental insurance quotes. "In Plain English," Renters Insurance is simply protection against the loss of things in your rental home or apartment. Getting a renters quote is the first step to making sure your rental home or apartment is covered. You can even customize your policy based on your specific situation like more insurance coverage for your jewelry or extra coverage for classic cars. Never shortchange yourself when it comes to your personal belongings and always protect yourself. 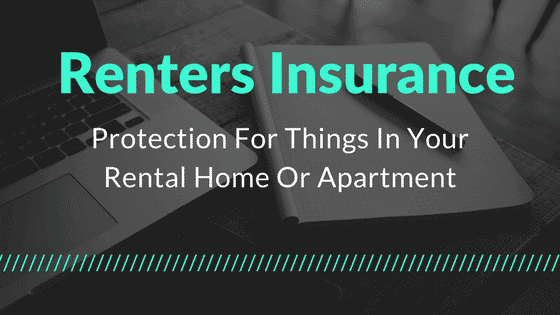 Check out what renters insurance covers. According to the Independent Insurance Agents and Brokers of America, about 81 Million Americans rent homes. However, 64.4 percent of them stated that they don't have some type of renters or apartment insurance. Their main reason for not purchasing the coverage was because of the cost. But the same survey showed that the actual average renters plan cost only $12 per month, or $144 per year. This is for $30,000 of property coverage and $100,000 of liability coverage. Remember that your Landlord will not be liable nor will they cover your personal property if there is a loss. Landlords will be covered for the actual structure of the building by their homeowners insurance. Instead of trying to get a cheap renters policy, just remember that in all honesty, it is probably as cheap as it is going to get for now. You should focus more on what benefits come with your renters insurance policy for the price you are paying. Just as you would do for auto insurance or life insurance. This is going to be the biggest myth of them all, getting a renter insurance plan couldn't be any cheaper. As a matter of fact, this type of insurance, on average only runs about $180 bucks per year. That's about $15.00 per month, and I am sure we can think of 100 things and different types of coverage we can easily spend $15.00 per month on, why not insurance. If you have ever looked at a budget or your monthly expenses you learn fast that those small purchases here and there tend to add up. The same is true about your personal property, while individually they might not be that valuable, but in-total they are worth much more. If you lost everything at one time, could you really afford to replace everything? Just because your landlord has Homeowners or Building Insurance and is probably getting a multipolicy discount, that doesn't mean you are covered. This coverage will only protect the structure of their building and not your personal items. If your apartment or rental home burns down, don't go looking to your landlord for answers or help because they aren't responsible for your personal items. Renters policies also cover things like liability insurance and medical insurance to protect you if someone is hurt while at your property. Also, this coverage doesn't just stop at your home, it can cover you no matter where you are in the world if you need to file general or catastrophe claims. Our product has something called global coverage that will protect you when you travel or if your car is broken into your items are covered. Don't believe the hype, you need to get rental home or apartment covered fast and get covered today. Another great benefit is that with a renters policy you aren't subject to underwriting. How Much Apartment Insurance Do I Need? On average, most rental insurance policies are for around $20,000 to $30,000 in property coverage. This is going to vary for each person, some people will have more expensive items and some people will want additional coverage overall for their home. The best thing about our insurance partner is that they offer their coverage based on Replacement Cost and you don't need any type of insurance discounts to get it. Replacement Cost means that you are covered for how much it would cost to replace the item, not how much the item is worth. When you are deciding on how much renters coverage you need, it's best to act like a detective. Figure out what everything will cost you, determine if you have specific risks like an exotic pet and come up with a number for a great starting point. You can buy business insurance without having to meet with anyone so why should there be any difference for renters. With the new technologies in the market along with website accessibility, you are able to get lower prices and much faster service. Our companies are able to figure out how to get renters insurance to you super fast. Get a quote within sixty seconds online and get you covered within a few minutes. When you get a rental insurance quote online, you save yourself time and gain peace of mind with immediate coverage from the best renters insurance company who is going to offer solid renters coverage.